"Libro intitulato Il tesoro del mondo" f. 38. The glass book, as it was published by Neri, did not contain any illustrations. If we hunt around in the alchemical literature and in museums, we can find examples of the apparatus and vessels on his list, but still, we might feel disappointed at not seeing the specific pieces with which our glassmaker was referencing. As it happens, we actually can see a number of these pieces, exactly as Neri experienced them. Over a decade before writing the glass book, when he had just completed Catholic seminary and become an ordained priest, Antonio Neri wrote a manuscript devoted to "all of alchemy" in which he shows us many of the same glass vessels. 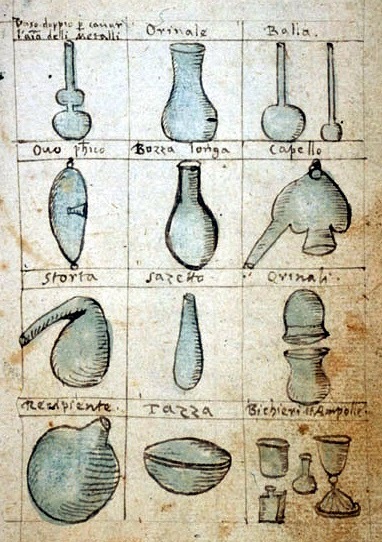 Here he lists and shows us (in the illustration, from left to right, top to bottom) a double vase, a urinal (yes, that kind of urinal), a pair of Florence flasks (the Italians now call this a pallone di Kjeldahl), a philosophic egg, another flask which Neri calls a “bozza longa”, an alembic (or still-head), a retort, a bottle, mouth-to-mouth urinals, a receiver (for a still or retort), a saucer, and assorted cups and ampules. Since many of these terms changed from place to place and over time, we can use this chart to get a much better idea of exactly what Neri was doing in his recipes. The use of urinals in his chemistry kit shows simple practicality; these were standard items made by glass factories. If a low-cost, readily available item could be used in the laboratory, so much the better.